One of the biggest challenges with battery life on Android devices over the years has been wakelocks. Wakelocks are caused by apps that constantly poll the phone for information. This prevents a phone from entering a deeper sleep state where minimal battery life is used. Since the phone can never enter deep sleep mode, it just sits there burning battery. There have been many third-party apps to detect and crack down on wakelocks, but it looks like Google is now getting involved. Users on Twitter (via Android Police) have reported that in the latest Android 8.1 Developer Preview the battery app is naming abusive apps. A warning appears in the battery settings with a red battery icon, the name of the offending app, and how it’s draining your battery. Tapping the warning will give you options to fix the issue. This may be as simple as killing the app or turning off location data for it. There’s no telling yet whether this new feature will make it into Android 8.1 when it releases to the public. Google has been known in the past to add features in developer previews only to remove them before a final release. But, it’s an encouraging development that Google is testing out a feature that gives users more information and control over their phones. 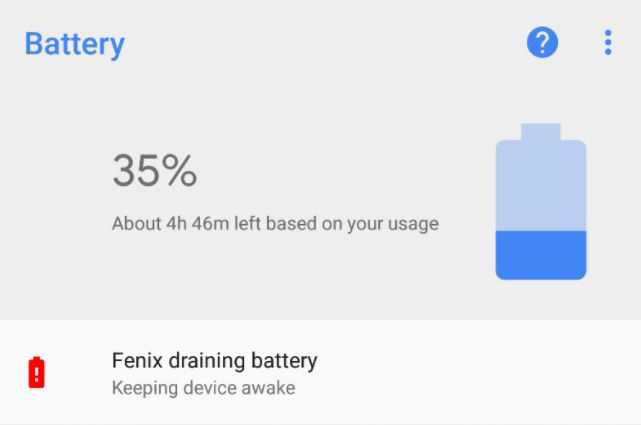 Google has long been trying to improve battery life with initiatives like Doze, but this takes it a step further. What do you think about Android’s new feature? Do you think it will actually lead to better battery life or just more annoying notifications? Let us know down in the comments. Apple hires Samsung battery bigwig: More durable iPhone batteries incoming?